1.1 “There wasn’t an exhibition, but there was a catalogue?”the interlocutor asked again. “Yes, a catalogue with no exhibition”, replied the other. 1.1.1 He went on: “When I was painting my circles, I didn’t know much about conceptual art; I must have seen some reproductions of minimal works in magazines. In reality, I was interested above all in Malevich and Mondrian. […] I was living in Paris. We produced that catalogue no1 before the events of May ‘68, in January and February”. 2.0.1 Otherwise put, Whereof one cannot speak, thereof one must be silent, as Wittgenstein put it. Whereof one cannot speak, thereof one must do, the way all great artists do, I would say. Would that really be so arrogant? 2.2 The challenge of our catalogue is thus above all the artist’s spatial and topographical autonomy, his production and his dissemination. The issues of so-called conceptual art as a linguistic or textual art, an art to be seen and read, to be made or unmade (or relieved of its material quality), or again as an art of the idea or the idea of art, all stem from artistic autonomy rather than conditioning it. It is tantamount to succumbing to a backward-looking illusion to end up with the equivalence: “catalogue = exhibition”, more theoretical, historicist and ideological in reality than pragmatic and material, or even materialist. Mosset thus points out that Alain Jouffroy had written in Opus international, which he had co-founded in 1968—who would have thought it—: “The best exhibition today in Paris is a catalogue”.14 As far as I know, January 5-31, 1969, in particular, did not receive any equivalent appreciation. And for good reason: Olivier Mosset’s very first catalogue sacrificed less to the utopia of the equivalence: /exhibition = catalogue/, than to the atopia of the following equation: /art = (non)exhibition and/or (non) catalogue/. 2.3 Conclusion but a provisional one. Even and above all if the following declaration already features in the imaginary interview in the catalogue no1. Which, by having thus far been, it just so happens, not hidden and not visible, has, as a result, kept a freshness which deliberately contrasts with our age which is just as adulterated as so-called contemporary: “catalogue – I am not having an exhibition (if someone asked me to, I might), but I thought that it would be as interesting to produce a catalogue without an exhibition, this is part of my activity as a painter. But it is probably also an autobiographical act, because this catalogue contains reproductions, an interview, autobiographical information, but it doesn’t contain and is not a canvas”. And otherwise put, it makes no objection to pictorial praxis. 2.3.1 […] “a priori, there is no reason why this painting should interest anyone, no more nor less than anything else, this seems to me to be sufficient reason to make a catalogue of it. As for the interview, it seemed to me that it could contain a few details about my relations with this painting, I think that’s all I have to say”.15 Or, if you prefer, I think that this is all that the catalogue no1 wants to do. 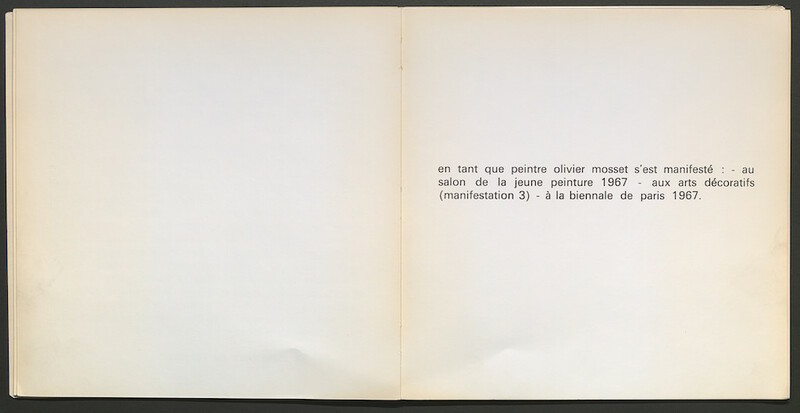 2.3.2 catalogue no1—in other words, on either side of the beat generation, doesn’t the present and past equanimity of Olivier Mosset’s work—albeit seemingly versatile—remain, for tomorrow, the other side of utopia? 3.1 Conversely, invited to take part in the group show “January 5-31, 2009”19, commemorating the 40th anniversary of Seth Siegelaub’s January Show”, this seemed to the painter reason enough to publish—in the catalogue of “January 5-31, 2009”, as it happens—four general black-and-white views, duly captioned, of the New York version of the exhibition “Before the End”. Meaning, in a word, pictures which, once again, had no reason for being exhibited, no more nor less in an art centre, and/or being reproduced, five years later, in a catalogue expressly and exclusively acting as an… exhibition. 3.2.1 So catalogue no1was not published either against such and such a painting, or against such and such a catalogue or exhibition. The fact is that one never paints—using such and such a medium—except against painting per se. Otherwise put, against the fact that it remains, nolens volens, always and everywhere liable to be (un)painted or even non-painted, which is to say imagined, lexicalized, photographed, printed and/or re-copied …ad libitum: Cosa mentale, as someone else put it. As such, any picture—in particular—is a fortiori a punctum caecum of all painting—in general. 2 Exh. cat. Olivier Mosset, Travaux/Works, 1966-2003, Lausanne, Musée cantonal des Beaux-Arts / St. Gallen, Kunstverein, St. Gallen Kunstmuseum, 22 May-10 August 2003 (our italics). 3 Olivier Mosset, Qu’est-ce que voir ?, op. cit., ENd éditions, Le Ban-Saint-Martin, 2012, p. 6-7. 4 Anne Mœglin-Delcroix, Esthétique du livre d’artiste, Une introduction à l’art contemporain (new edition, revised and enlarged), Marseille / Paris, Le mot et le reste / BNF, 2012, p. 156, note 1 (our italics); let it be noted that Mosset does not feature anywhere in this book’s index, any more than he does in: Alexander Alberro, Conceptual Art and the Politics of Publicity, Cambridge, Mass. / London, MIT Press, 2003. 6 Qu’est-ce que voir ?, op. cit., p. 14 ; exh.cat. Olivier Mosset, op. cit., p. 119. 7 Qu’est-ce que voir ?, op. cit., p. 13. 8 This exhibition was held in October 1969, so well after the “January Show” put on by S. Siegelaub, for example ; Cf. exh.cat.. Conception. Conceptual documents 1968 to 1972 (ed. Catherine Moseley), Norwich / Leeds / Vancouver, Norwich School of Art / City Museum and Art Gallery and Henry Moore Institute Library / Morris and Helen Belkin Art Gallery, University of British Columbia, 2001, p. 115. 9 Exh. cat. Conception. Conceptual documents 1968 to 1972, op. cit., p. 115. 11 Qu’est-ce que voir ?, op. cit., p. 10. 3 “Takis was unhappy with the way it was represented in the exhibition. He and his supporters felt that the artist should have autonomy over the work’s presentation. The event became a focal point for artists having a say over their work was shown, and led to MoMA’s acceptance of the AWC’s demand that artist should be represented on the board of trustees.” From Conceptualism to Feminism, op. cit., p. 261 ; it was also on that occasion that L. Lippard and S. Siegelaub met and, in their turn, conjugated art with life. op. cit., p. 72. 14 Qu’est-ce que voir ?, op. cit., p. 14. 6 Exh.cat. Olivier Mosset, Travaux/Works, op. cit., p. 124. 8 “ Before the end (Part II)”, Le Consortium, Dijon (23 March-19 June 2004) and “Before the End (The Last Painting Show)”, The Swiss Institute – Contemporary Art, New York (14 September-23 October 2004) ; “The idea behind this exhibition is to show the last paintings of conceptual artists, who often, before becoming conceptual artists, were abstract painters with works often minimal, sometimes monochromatic”, dixit Mosset. The exhibition included works by Art & Language, Michael Asher, Robert Barry, Ian Burn, Jan Dibbets, Douglas Huebler, Joseph Kosuth, Lawrence Weiner and Ian Wilson (http://www.swissinstitute.net/2001-2006/Exhibitions/2004_before/before_inst.htm). This more or less definitive renunciation of painting concerned, in particular, Art & Language, a collective that was all the more radical because it had to unabashedly undertake a comeback that was as pictorial (as it was caricatural) at the Jeu de Paume in 1994 : http://www.tobeart.com/Collectifs/Art&Langage-JdP93.htm (among others). 20 Exh.cat. Olivier Mosset, Travaux/Works, op. cit., p. 124. 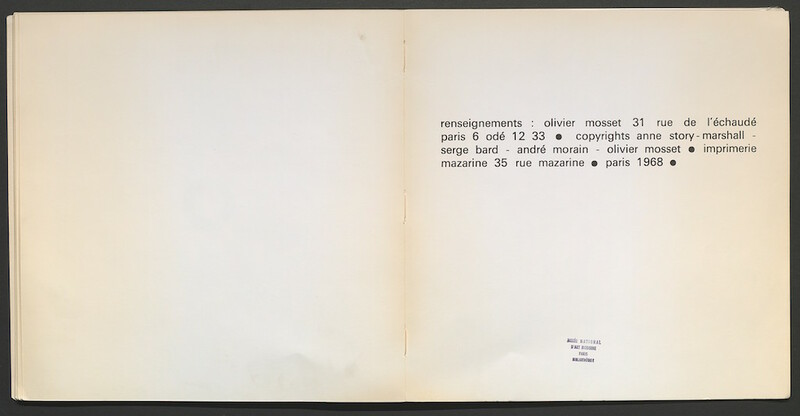 The preceding article, dealing with Olivier Mosset’s extremely modest catalogue no1, shows, in its own way, that, in effect, May ’68 Did Not Take Place (the title of an essay written by Gilles Deleuze and Félix Guattari and published in 1968). Through the restricted exhibition it resulted from, as well as its publication date (2013)1, the article was not part of the aftermath caused by the more or less obituarial May ’68 commemorations of the moment. But because it is being published here in this 50th anniversary year, it reminds us, in its own way, that, in effect, in revolutions “there is always an event element, which cannot be reduced to forms of social determinism, causal series”, or the genealogical and chronological sequences which underpin notions of filiation and influence in art history. For, as the above-mentioned duo points out, “the event itself is disconnected from forms of causality, and breaks with them: it is a bifurcation, a deviation in relation to laws, an unstable state which opens up a new field of possibility”. 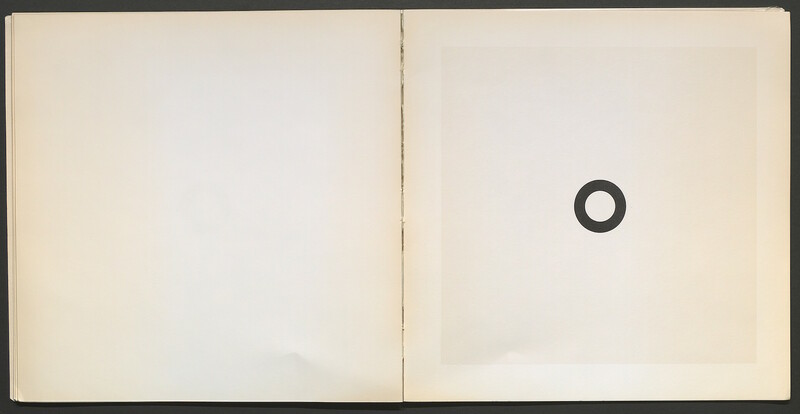 The article actually shows that Mosset, who was not very well informed about so-called conceptual art, nevertheless published catalogue no1 in 1968. It was not only the artist’s first catalogue; it was also the first catalogue—up until further notice, anyway—that had no accompanying show. As such, it was also free of any (exhibition) venue. The fact is that the production of a catalogue that merges with an exhibition happened—likewise but in tandem—on the other side of the Atlantic just a few months later. For if the autotelic catalogue sprang to the mind of a (Swiss) painter in Europe, it—almost—simultaneously sprang to the mind of American artists who, conversely, had given up painting. To such an extent—and contrary to the diachronic approach that hallmarks the art history vulgate—that it was paradoxically not so much from an idea as from economic and material constraints that both so-called conceptual or de-materialized art and the then pictographic activism of the former BMPT member issued. catalogue no1 thus does indeed represent, as such, an un(fore)seeable and untimely bifurcation. In parallel with the events of ’68, it is all the more of an event because it came at once chronologically before the first autotelic catalogues, and historiographically after it was eclipsed and forgotten about (by art historians and other counterparts of the artist for almost 50 years)… And it was also probably unbeknownst to most veterans of ’68—“sixty-eighters”—and the New York art scene that that art event took place; even and above all if, in a modest survey published in April 1968 in the 6th issue of the magazine Opus International (p.94), Alain Jouffroy straight away decreed: “The most significant exhibition of painting recently held in Paris boils down to a square catalogue”. Whatever the case, may this catalogue no1—over and above the 50th May ’68 (funereal) anniversary celebrations, which in fact got under way actually in 1968, as is shown by the unfinished film titled La reprise du travail aux usines Wonder [Resumption of work at the ‘Wonder’ factory]2, for example—long continue to exhale the scent of that sprig of lily-of-the-valley which, in spite of everything, remains forever on the point of bursting into flower.